I would like to introduce various kinds of Korean food and cooking class of which you can experience anytime in Korea. Korean cuisine is largely based on rice, vegetables, and meats. Traditional Korean meals are noted for the number of side dishes (반찬; banchan) that accompany steam-cooked short-grain rice. Kimchi is served at nearly every meal. Commonly used ingredients include sesame oil, doenjang (fermented bean paste), soy sauce, salt, garlic, ginger, pepper flakes, gochujang (fermented red chili paste) and napa cabbage. Ingredients and dishes vary by province. Many regional dishes have become national, and dishes that were once regional have proliferated in different variations across the country. Korean royal court cuisine once brought all of the unique regional specialties together for the royal family. Foods are regulated by Korean cultural etiquette. 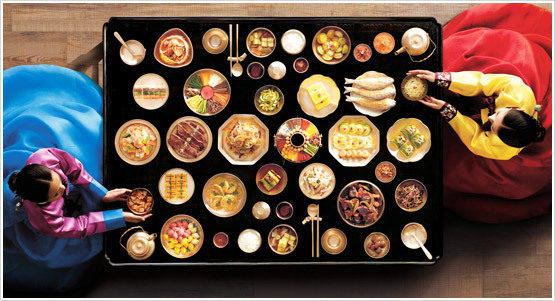 Korean meals and foods, unlike western course meals, are served in a single setting. We call this Bansang charim, where the rice (Bap in Korean) and side dishes (Banchan in Korean) are set together on the table. A bansang can be very simple, consisting of rice, soup, soy sauce, kimchi, grilled fish, and a vegetable dish. But it can also be extravagant with so many dishes spread out on the table that the table legs figuratively ‘bend’. Regardless of the scale, the key point is that the combination is balanced and harmonious in therms of taste and nutrition. Jangdokdae (soy jar terrace). An area outside the kitchen used to storage large brown-glazed pottery jars containing soy paste, soy sauce and chili paste. Fermented foods are central to the Korean diet, including several well-known examples; kimchi, salted seafood (Jeotgal), and fermented condiments such as soy sauce (Ganjang), soybean paste (Doenjang) and red chili paste (Gochujang). Oftentimes, the phrase ‘a deep flavor’ is used to describe many Korean dishes. The expression refers to the complex taste that comes from seasoning with sauces that takes years to ferment and mature. Kimch, which has over 350 known variations depending on ingredients and taste, has recently gained international recognition as a great source of lactobacilli and dietary fiber. And, in the contemporary living life in Korea, every house has at least one ‘Kimchi refrigerator’ at home which is one of the most unique electronic home ware for containing Kimchi at home. Fermented condiments, including soy sauce, soybean paste and red chili paste, not only provide flavor but also significant nutritional benefits. As they are made mainly from protein-rich soybeans, these fermented sauces add protein to the side dishes which mainly consist of grains and vegetables. Amino acid created in the breakdown of proteins add a subtle flavor that envelops the palate, while microorganisms from the fermented condiments improve health through their digestion regulation and anti-oxidant properties. All fermented condiments are ‘live foods’ packed with enzymes. Kimchi is a well-known food rich in fiber and lactobacilli which promote digestion and physiological well-being.